PRODUCT: Sievert PS2960 TurboRoofer Field Torch Kit. 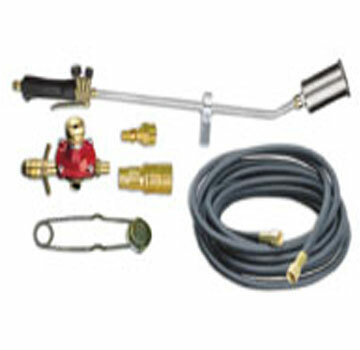 32 inch steel torch with 225,000-375,000 BTU/hr, 25 foot hose, POL Adjustable Regulator, Flint Striker. Price/Kit. The TurboRoofer line features a “Dual Valve” handle and quality brass and stainless steel construction. The dual valve allows for infinite adjustment of the pilot flame and main flame. FEATURES: Combination kit comes with two torches with quick connects for easy changing out between detail and field torch. Quality one piece construction. Sievert # DS4460 TurboRoofer Detail Torch Kit. Features 175,000-300,000 BTU/Hr Maximum Heating Capacity, Pro-88 Handle, 2-inch OD brass head, 7-inch steel necktube with stand, 18-inch overall length, 25 foot hose, POL regulator. Price/Each.